Yeti is a very balanced, moderate ram across the board, no extremes here. 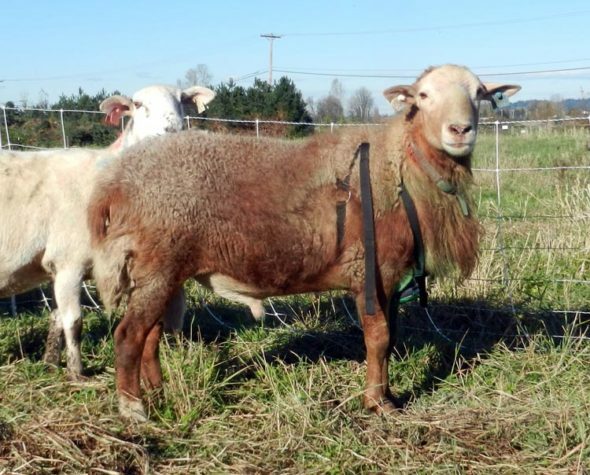 He is a very pretty Hereford-red ram with a long body and muscular hindquarters. He has really good growth EBVs, and has turned out to be a moderate-sized adult, which is the combo I prefer for easy management. He is very calm and easy to handle. His maternal side captures genetics from David Coplen’s Birch Cove Farm in Missouri, where heavy selection pressure is placed on easy-care pasture-raised sheep with measured parasite resistance, coming from a long line of NSIP-focused breeding programs. This ram is more focused on growth and less on maternal traits, so will make a great sire for butcher lambs and replacement ewes out of maternal girls that need improvement on growth. He can be an imperfect shedder, in the photo you can see he retained some “pants” but it is usually very minor and not something I prioritize in production sheep. I used this ram for two years and am replacing him with a son out of a purchased ewe to bring myself some fresh genetics that still retain his desirable traits. EBVs from 2017 lamb crop sixty day weight data. Pictured here breeding in his yearling year.